I can’t tell you how excited I was when I found out that Seabrooke Leckie of The Marvelous in Nature and the North American Moths had started a blog carnival about moths. Mothing is all the rage these days, and websites like the North American Moth Photographer’s Group, Bugguide, and Butterflies and Moths of North America have made it easier than ever to identify North American moths by photograph. The Moth and Me is a carnival that provides a place for bloggers, moth-curious and moth-obsessed alike, to gather and share photos and stories of our adventures. Despite the interest expressed by several bloggers with respect to the carnival, the response to Seabrooke’s photo quiz in the last edition was, well, underwhelming. That, and the fact that she’s been involved in a move this summer has meant a slight delay in the publication the 5th instar, er, installment, of The Moth and Me. I wanted to help by hosting this brand new edition, complete with a plea for submissions from all of you closet moth photographers hiding out there in the new moon night of the nature blogosphere. Check out the sweet banner you could have on your site right now! Barefootheart at the Willow House Chronicles helped promote the last edition of this carnival (The Moth and Me #4) with a post that featured an observation of Virginia Ctenucha. It would be great if more nature bloggers followed suit and took up the cause! You see, if you don’t submit your posts, Seabrooke and I have to hunt you down and feature your post anyway. And we don’t like doing that (we’d rather be mothing and we’re afraid we’ll miss some great posts). If moths are a new interest, the first step is taking some pictures of them and getting a post up. If Mike at 10,000 Birds could take a break from blogging about birds (and incinerating a giant fowl) to post some excellent photos of the Moths of Chicken Inferno 2009, you can surely post some pictures of moths from your porch light! One of the great reasons to study moths is the thrill of seeing new species on a regular basis. Natural Notes saw a striking Clymene Moth for the first time and posted a nice photo here. The number of species of moths that most of us can find at our back porch light far exceeds the number of species of birds that come to our feeder or visit our yard, so there’s seldom a shortage of beautiful new species for those willing to look. 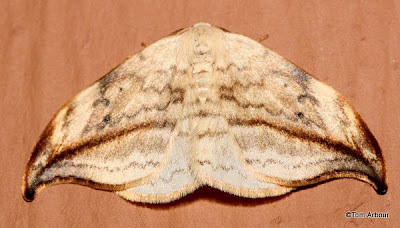 John at A DC Birding Blog took the time to look at (and photograph) some Assorted Recent Moths. Tom at The Ohio Nature Blog did too, in his post titled The Biodiversity of Moths. Tom captured one of my favorite moths, the Arched Hooktip. If you check lights regularly in the northeast, you’re likely to see this species. Doug at Gossamer Tapestry featured a late-night stakeout for the rare Leadplant Flower Moth and also shared with us a visit to that mecca of all things insect, the Magic Gas Station. Keeping with the theme of looking for leps at other people’s lights, Susannah at Wanderin’ Weeta dared to explore the unknown reaches of the map outside of a country motel in Here be moths. Her picture of a Glorious Habrosyne succeeded in shivering our lepidopterological timbers. “Field guides? Field guides? We don’t need no stinking field guides!” Eric of Bug Eric (he of Kaufman Field Guide to Insects of North America fame) explores pelage for camouflage in More moth fashions. As we move into September, Brian at Calderdale Moths, Butterflies and Dragonflies reminds us that September 18-19, 2009 is National Moth Night in Britain. This event encourages moth enthusiasts to observe moths across the country! For more information, check out the official National Moth Night site. Those Brits are way ahead of us in their work on insect conservation, and moths are no exception! Martin’s Moths has featured lots of great moth posts lately, including this Rosy Rustic and a moth-related beer he discovered! Jim at Norfolk Moths recently tested a unique method of transporting his trapping gear (and beer) to the field site. Another Brit, Rob Laughton, has recently started a gorgeous moth blog called Urban Moths. Go check out his latest, August Moth Trapping, Part II. If you haven’t had enough UK moths yet, check out Ben’s Essex Moths, which features photo-illustrated trapping reports. I’m sure I’ve missed some of the great blogs on the British mothing scene, but hopefully they’ll submit posts to the next edition. Now, for those of you who think that mothing requires late nights of sitting up bleary-eyed in front of a glorified tanning bed lamp, or roaming the dark woods trying to figure out exactly which tree you painted the rotten banana-and-beer slurry onto at dusk, you’re only partially right. Some moths are day-fliers! Among the coolest of these are the hummingbird moths or clearwing sphinx moths of the genus Hemaris, featured at Robin’s Nesting Place. Most caterpillars are moths in waiting (it takes some time and effort to eat that much), and you can find lots of them in broad daylight, when normal people are known to be awake. In fact, rearing caterpillars in captivity is an important way to procure voucher specimens and establish hostplant relationships. Nuthatch at Bootstrap Analysis takes us through raising silk moth and sphinx moth caterpillars in 100 hungry mouths to feed. Martin of Nature in the Ozarks features a Cecropia Moth caterpillar and adult, while Seabrooke adds to the caterpillar frenzy with a nice image of a Banded Tussock Moth cat at The Marvelous in Nature. Finally, I leave you with a photo of a stunning Sphinx moth caterpillar that I was lucky to encounter on my recent trip to South Carolina. I’ll be featuring a few caterpillars, including another Sphinx species in an upcoming post right here at The Modern Naturalist. Thanks for reading The Moth and Me! Great carnival post! I don’t think I sent my post in (it’s been crazy around here, and I’m suffering from sieve brain), so thanks for including it anyhow. I might be interested in hosting sometime fairly soon. I’ll contact Seabrooke as soon as life slows to a normal pace. Thanks for the feedback Susannah! Don’t worry about not having sent in your post. I don’t think any submission dates for this edition were advertised – I put it together at the last minute by finding the material and compiling it. But, as you can tell from the post, we are trying to generate more participation in this carnival for future editions, so please do submit next time, and thanks for considering hosting it!! Amazing Sphinx caterpillar! Thanks for putting the Carnival together. Nice work. Thanks barefootheart! I was pretty excited about that Banded Sphinx too. When I linked to this post on facebook, a friend of mine sent me a pic he had taken of one in Maryland, well outside the permanent range of the species in the southeast. Just goes to show you never know what will turn up when mothing! Keep up the nice work on your blog. The latest Circus of the Spineless is up, at Confession (CotS #43). I included a link to this carnival. Thanks Susannah! I appreciate that. I was actually going to submit my recent spider post, but didn’t get a chance to do it. Thanks for helping promote TMaM! Thanks Kirk! Sorry the posts have been a little slow lately. It’s been a busy few weeks for me! Glad you are enjoying the blog and thanks for the feedback. I love moths…and yet I really don’t know much about them! So so BEAUTIFUL! I was just in Alabama recently and I am kicking myself for not taking a picture of a big fuzzy white moth I saw outside my balcony…I can’t seem to find a picture of a moth like her anywhere!! !